Alan Dalby was born in Linton in 1892, the son of John Thomas Dalby and his wife Elizabeth. In 1911, Alan was living with his parents and one of his brothers, Maurice, at Hillside Cottage, Linton. We do not have exact service details for Alan, but we know that he served as a corporal in the Royal Army Medical Corps. Alan was awarded the British War Medal and the Victory medal, but was not eligible for the 1914 or 1915 Star so his service overseas must have started after the 31st December 1915. 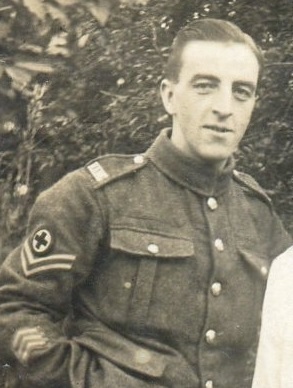 However the photograph of Alan (above) shows three overseas service stripes (miniature inverted chevrons) on his right arm. Each stripe signified the number of years service overseas and were instituted in January 1918. Thus Alan in 1918 had served overseas for a minimum of 2 years and 1 day overseas. He is likely to have first gone abroad for service around in 1916. Alan's service record has not survived and we do not, at present, know where he might have served or with which unit. After the war, Alan returned to the area and worked as a railway clerk. On the 27th December 1922 he married Mary Lilian Rutherfoord in Collingham parish church.